Beach days. With dogs. I really can’t imagine anything better. Admittedly, taking a dog to the beach can be tough. There’s a lot going on. If it’s a beach day, the weather is probably hot. And if you’re going to a saltwater beach, you’ll need to lug lots of drinking water with you, for you and your pooch. But with the right dog, the right beach, and the right attitude, beach days with dogs can be heaven. So, do you have the right dog? I think a beach-ready dog has two key attributes: excellent recall and a love of the water. The first is essential for practicing good beach etiquette. If your dog is running amok and bothering other people, that’s not okay. The second is essential for staying cool and having fun. What do I mean by “the right beach”? It’s simple. You need to find a beach that isn’t crowded. Luckily, in the HRM, there are lots of options. Looking for a family-friendly beach with bathrooms, outdoor showers and ice cream? Head to Rainbow Haven. How about beautiful, crystal blue waters? Crystal Crescent will deliver. Want to do some surfing? I hear Lawrencetown Beach is your best bet. And if escaping the crowds is your goal, Conrad’s Beach is for you. I love this beach. I love it because it’s big, it’s beautiful, and if you walk ten minutes in either direction, you’ll have a great big piece of heaven all to yourself. This means great things for you and your pooch. So when it comes to choosing the “right beach”, in the HRM, to me that means Conrad’s Beach. Finally, to have a stellar beach day with your dog, you need to have the right attitude. This will mean different things depending on the day and the dog, but for me and Dallas, it means understanding that when we arrive, she will literally freak out with excitement, pulling on her leash like a maniac the entire 15-minute walk down the boardwalk and across the beach. This can be tough to handle when you’re also lugging a cooler, a water jug, a beach bag and a chuck-it. It doesn’t help that as soon as we get off the boardwalk and onto the beach, when we’re in the most crowded area, 9 times out of 10 Dallas will literally poop her pants with excitement. Except she doesn’t wear pants so this means putting down all of the gear, digging out a poop bag, and tending to that poop bag for the next few hours, in the hot sun, until we’re headed back to the vehicle and can drop it off in the one garbage can by the road. I’ve also come to accept (years later) that beach days are not about lounging in the sun and diving into a good book. They’re about throwing the ball or frisbee and romping in the ocean with my best pal. Which is pretty awesome, especially now that I know exactly what to expect. 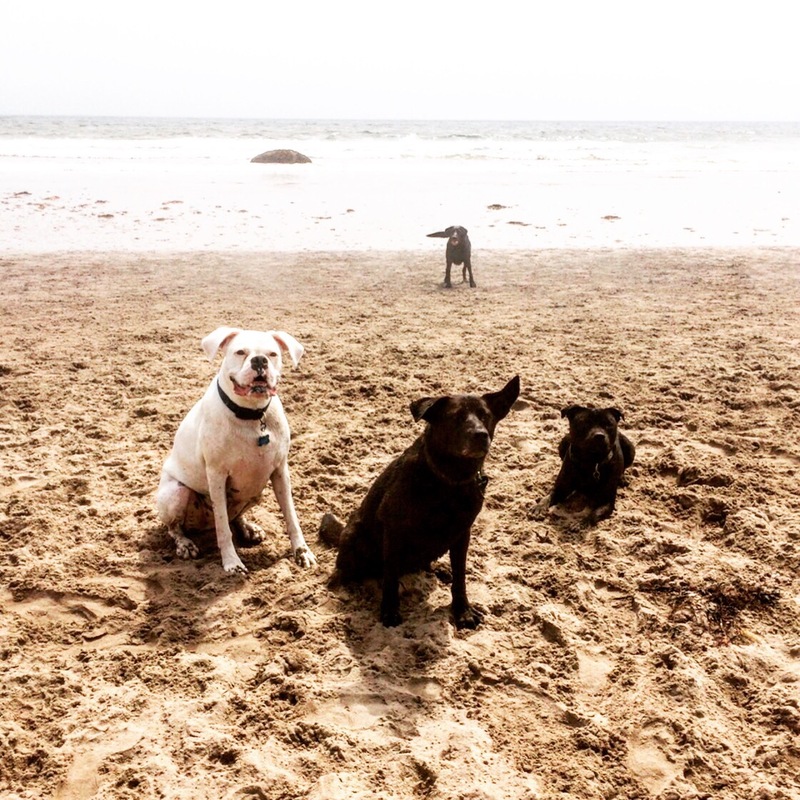 Here’s to spending the best days of summer at the beach with your pooch. And happy Fetch Friday, everyone.